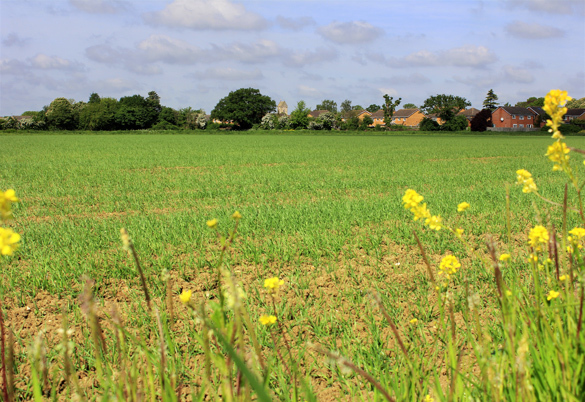 Larkfleet Homes are proposing development of approximately 280 new homes (30 more than indicated in the Local Plan) on an area of farmland to the east of Eyebury Road. The proposed plan has the entry and exit to the new estate on to Eyebury Road to the south of the Primary School. Tuesday 22 May 2018 between 5 pm and 8 pm. Eye Primary School, Eyebury Road, Eye, PE6 7TD. Members of the parish council are hoping to attend and we recommend parishioners attend and make their views heard. The Local Plan has committed the developer to a high level of engagement with appropriate stakeholders including the local community in the development of a Masterplan (below). 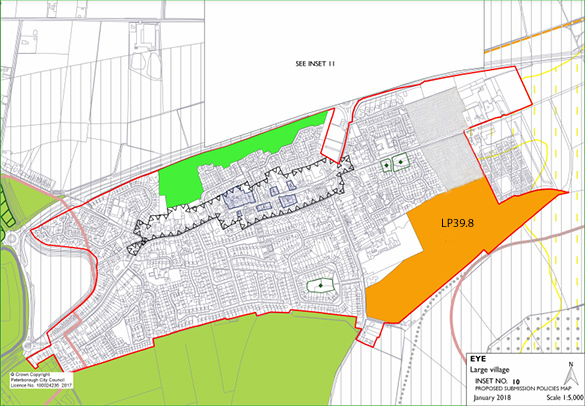 The area of farmland to the east of Eyebury Road (also known as policy LP39.8: Tanholt Farm in the plan) has been allocated for housing by Peterborough City Council in the submission version of the new Local Plan. Just to the west of Eye parish are LP35.6 Norwood and LP35.2 Paston Reserve with a combined total of 2,963 dwellings*. * Dwelling numbers are indicative. The plan was submitted to the Secretary of State on 26 March 2018. The plan will be examined by an independent inspector. At the time of this post, the plan has not yet been ‘signed off’. The area of land proposed for development. The Peterborough Local Plan required that a master plan would have to be produced prior to the approval of detailed proposals for the Eyebury Road development. Policy LP40 below set out those guiding principles. Prior to the approval of detailed proposals for the site at Tanholt Farm, Eye (Site LP39.8) an outline planning application comprising, amongst other matters, a comprehensive masterplan for the whole area should be submitted and approved by the council. In developing the masterplan there should be a high level of engagement with appropriate stakeholders including the local community. Details of the long term governance structure for the development, addressing issues such as community involvement and engagement and any financial arrangements to ensure long term viability of facilities. With the exception of minor proposals of very limited consequence to the overall redevelopment of the entire site, the council will not approve any detailed planning proposals for any parts of the site until, and subsequently in accordance with, a comprehensive planning permission for the entire site has been achieved (including any agreed Planning Obligation to ensure specific elements of the wider scheme are guaranteed to be delivered).